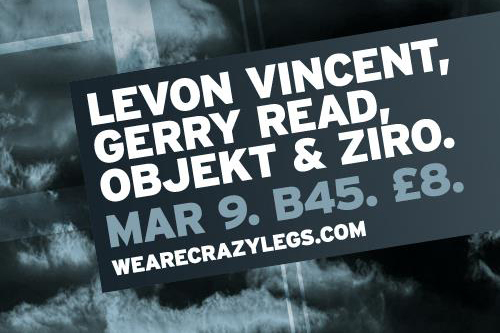 Next week, Crazylegs do it again with a lineup that stands strong against any and features top notch DJs Levon Vincent, Gerry Read, Objekt and Ziro. This one’s a lineup you would be mad to miss. 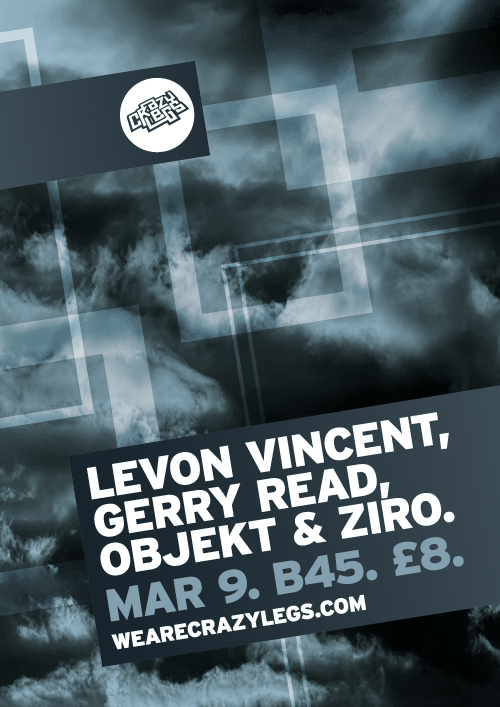 Levon Vincent of NYC has been bought in to head the bill – he’s literally a legend in his game and is sure to bring the house down with his industrial techno sound. Backing up the bill is one of my favourite producers of 2011, Berlin based Objekt. You only have to read my review of his recent release on Hessle Audio to grasp how I feel about this guy. We also see support from two more young producers set to do big things this year: Gerry Read heads into the game this year with a few strong releases already under his belt on Ramp Recordings, his sound standing so strong in the scene. I’d also be watching out for a personal friend of mine, the one they call Ziro, a producer acclaimed by Mosca who seems to have come from nowhere and is set to tear up the UK dance scene. The night kicks off at 11pm at the Basement 45 nightclub, Frogmore Street, Bristol. Tickets are on sale now at Resident Adviser.